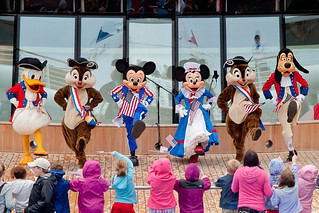 Mickey, Minnie and the gang show off their patriotic finery on the Fourth of July aboard the Disney Wonder en route from Alaska back to Vancouver, BC. 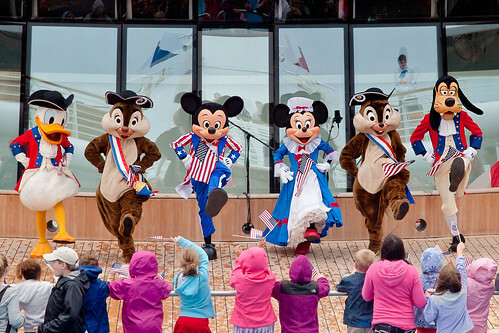 It was great to see this special Fourth of July show on our trip, made slightly disorienting by the fact that it was the coldest day of the trip and we were in Canadian waters. The barbeque on deck felt particularly out of place in the cold drizzle. We were also aboard for Canada Day, which happened while we were in the US. Although there was a note about it in the daily program there were no big productions like this one.